In this enlightening book, internationally renowned psychic and author Elsabe Smit breaks down some key concepts of spiritual development into short, highly accessible articles, and provides ways in which you can find spiritual meaning in your daily life. She questions mundane experiences and finds the practical meaning of spirit in this age of enlightenment. All experiences, whether you label them as ‘good’ or ‘bad’, are simply stepping stones on a journey towards finding self-acceptance and compassion in this age of enlightenment. Elsabe will show you how to discover spiritual meaning and appreciate your life. How to find your way through life with pen and paper rather than expensive therapy by using the most potent journaling method known. The book is written as a series of short articles with useful prompts throughout that encourage you to pause and reflect, make notes, answer questions and complete exercises. By the end of this book you will define spirituality in your own way an understand what enlightenment is about. 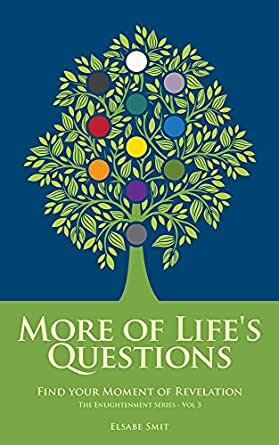 Download "More of Life’s Questions: Find Your Moment of Revelation (The Enlightenment Series Volume 3)” today, and read or listen to this book on Kindle, computer, tablet or smartphone.